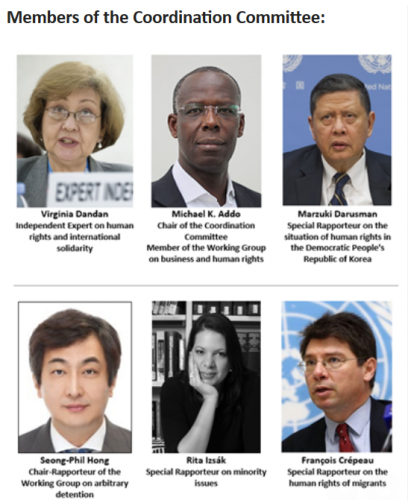 United Nations experts from over 30 countries took part in this Webinar on the Human Rights Agenda. Members of the Coordination Committee were François Crépeau, Special Rapporteur on the human rights of migrants, Virginia Dandan, Independent Expert on human rights and international solidarity, Michael K. Addo, Member of the Working Group on business and human rights, Marzuki Darusman, Special Rapporteur on the situation of human rights in the Democratic People’s Republic of Korea, Seong-Phil Hong, Chair-Rapporteur of the Working Group on arbitrary detention, and Rita Izsák, Special Rapporteur on minority issues. Increasingly, we are beginning to understand and perceive human rights as not an isolated discipline. It’s a discipline that touches on development, it’s a discipline that touches on peace and security, and it’s a discipline that is pervasive across the work the United Nations. A very practical recommendation that came up today is to utilize the 2030 Agenda for Sustainable Development as an opportunity to mainstream human rights and I think we have a lot of possibilities to look at the 17 goals and then use human rights principles. My experience of the country team has always been very, very positive both in terms of organization and in terms of gathering information, indicating the right sources of information and then pushing for implementation [of recommendations].